Ines Temple heads the leading career transition and talent development firms in both Peru and Chile, LHH DBM Peru and Chile. She’s accumulated a wealth of insightful tips to share about personal branding and employability. Her book, Usted S. A. 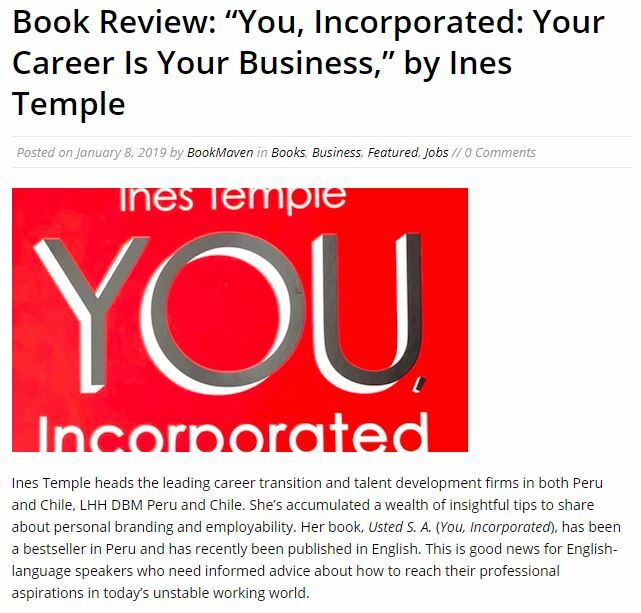 (You, Incorporated), has been a bestseller in Peru and has recently been published in English. This is good news for English-language speakers who need informed advice about how to reach their professional aspirations in today’s unstable working world. You, Incorporated describes a formula for identifying our level of employability by recognizing what value we offer, and where we need to improve any limitations. We need to continually develop the skills needed in our professions before we find ourselves in an unexpected job transition. We must stay current in our industry and study the job market even when we’re not looking for a job. And, we have to continually quantify the value we add to our employer and clients and claim our achievements. Remaining persistently proactive in pursuing our career goals will help us stay ahead of the competition. Temple stresses the consideration that today’s professionals need to pay to their digital identities. Personal branding needs to be given continuous attention and care. She warns that a stellar reputation can be toppled in an instant, and that we must be vigilant about remaining professional in both our personal dealings and our online presence. A good reputation is our best selling point. If we make a mistake along the way, it’s important to make amends with humility and authenticity. Importantly, You, Incorporated shares how to approach our careers as though we’re the CEO, CFO, marketing director, head of sales and head of research in our corporation of one. By clearly defining our goals and working diligently at fulfilling them, we’ll follow the career path that gives us professional and personal satisfaction — and position ourselves to weather any volatile business climate.